Seeing how I hurt my knee, Friday hockey was been put on hold for a month. Thus, I could actually celebrate Viv's birthday for once. Yes, I can't believe she has not done a Lorena Bobbitt on me all these years... However, I didn't have anything planned for her actual birthday because I had already made arrangements for the following day (since I was expected to play my league game prior to my injury). So when Costanza called asking if we wanted to go for some fish 'n Chips, I left it up to Viv to make the decision. Hey, I wasn't really sure if she wanted to go for fried fish on her birthday. Surprisingly, she was game considering where we were going. Hey, no offense to the Sea House, but it isn't typically a place someone goes on their birthday. No matter, food is food and it really doesn't matter where we find it. The Sea House is a family-run fish 'n chip joint that is more function than flash. Hence, it is reflected in the prices. 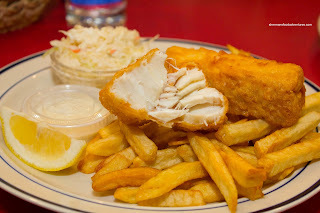 For $10.95, I was able to score a 2 piece Halibut & Chips which included coleslaw and a choice of soup or soft drink. With the Chinese in me taking over, I went for the Clam Chowder because of the perceived value compared to carbonated water. 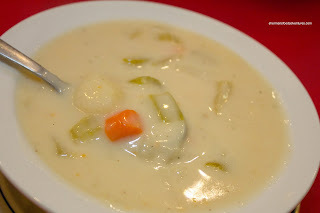 The chowder reminded me of the ones one would find at a Hong Kong-style cafe. You know, the type that does not have any clam taste and employs starch as a thickening agent. Not a "New England" style of clam chowder for sure, but okay for what it was. 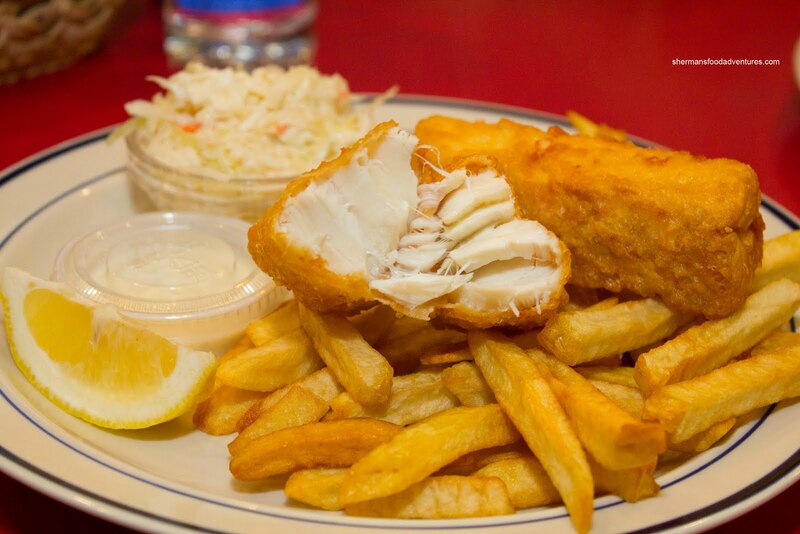 Now, I can't be as kind with the Halibut & Chips though. The fries were actually pretty good being slightly crisp. The halibut, on the other hand, was overcooked. As you can see in the picture, the flesh was no longer flaky, rather it is just plain dry and stringy. Too bad really. Also, I wasn't a huge fan of their tartar sauce either. Flavourwise, it was fine with a slight tang. It was just too runny. I liked the coleslaw though, it was tangy, crunchy and easy on the mayo. On the flipside, Viv's one piece Cod & Chips was excellent (a real deal at $5.50 including soup!). I realize that cod is a much more forgiving fish when it comes to cooking time, but it really was better. The fish was moist and flaky while the batter was light and crispy. On that note, it appears that the batter had a high starch content. 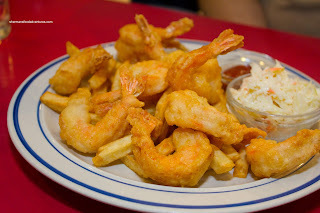 Costanza wanted to change things up and had the Fried Prawns Dinner. With a dozen perfectly fried prawns, this was actually a substantial meal. Well, not to Costanza apparently... He wanted to order another of fish and chips! I guess that is how he maintains his round figure... Back to the prawns, they had a nice snap and the batter was light and crispy. Finally, guess what my son had? Yes, a Grilled Ham and Cheese... at a fish 'n chip joint. Does he aspire to be like Miss Y? Order something completely off the charts at a restaurant that specializes in everything but. Well, what can I say? 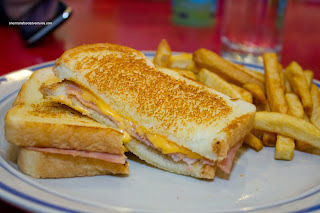 It was a grilled ham and cheese with processed cheese and ham. Toasted up nicely though and well-priced at $4.25. 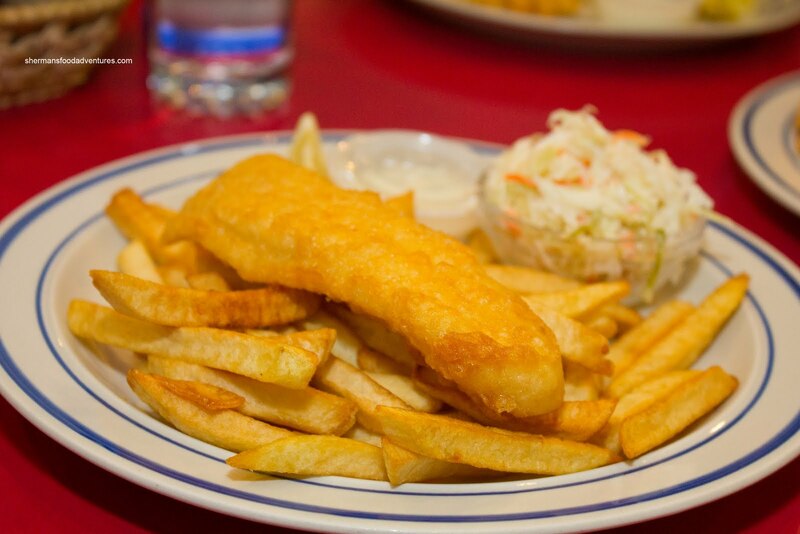 My daughter did the right thing and had the kid's fish 'n chips with a glass of apple juice. Great value at $2.95. Sums is all up though. 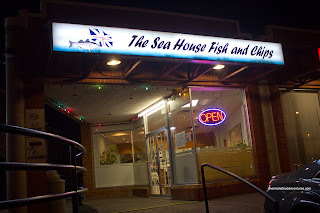 You can eat well for spare change here and despite the overcooked halibut, most of the other food is more than acceptable especially for the price.